Last week was the Spring Break Surgical Trip and for many it was the first time with a mission team. The surgical components were Ophthalmology and Orthopedics with veteran surgeons and their families returning. The students were for the most part from Lipscomb University in Nashville, Tennessee and this helped create energy for activities and lower the average age for the rest of us. "Time out" Has anyone seen the patient! When it came to patient care and activities surrounding cases their was plenty of assistance and teaching opportunities. The students were enthusiastic to learn and it was exciting to watch as many experience their first time to see a surgical case. We are back in Antigua from being on the coast for a surgical trip with Health Talents. 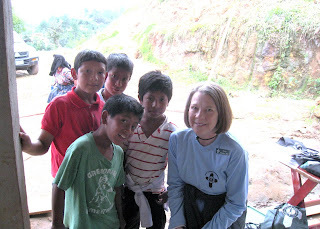 Sheri traveled with children and parents from the highlands who were scheduled for cleft lip or palate repair. If I counted correctly there were 11 children who had this surgery during the week. There were many other types of plastic cases also. We have attached a picture of one of the children who was sponsored by a family in our church in Columbia, Missouri. The child's father accompanied him from the highlands and stayed all week walking him around to comfort him. This was a special week for us as we were able to be with friends we had know from Jackson, Mississippi. I was able to scrub and assist with most of the GYN cases and a few General cases. I am constantly impressed how the patients show their faith in God and give him the praise for the opportunity to have surgery and then recovery of surgery. When they walk out of the hospital with family they are smiling and giving hugs and kisses to the staff. Neva had a busy week in the recovery room taking care of many women who had GYN surgery and women, men, and a few children who had hernias, gall bladder surgery, etc. She enjoyed working with old friends like Bonnie Spink and making new acquaintances. She said that everyone worked so well together that it made for a very enjoyable time. Above is a picture of Brittany, their charge nurse for the week. I captured a visitor to one of the patients on the last day with Neva. She had her hands raised and was praising God for all he had done. We look forward to going back in February for a GYN/Plastics week of surgery. Neva and I returned to Antigua Saturday, January 8, from the cold and snowy Missouri weather. Below is a picture demonstrating my skills in the field of snow people creations. Our children suggest that I should not pursue this as a career choice. We are looking forward to the opportunity of serving here in Guatemala with the HTI surgical teams and volunteering here in Antigua during 2011. We encourage you to look at Sheri's blog site that is to the right of our blog. 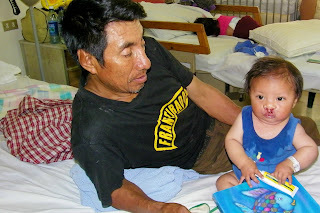 The blog shows the pictures of several children who have a cleft lip and/or cleft palate who are tentatively scheduled for surgery. There are two families in our home congregation who are providing the financial support for their surgery. We are thankful for their support and encouragement....they know who they are!! When we are not participating with HTI medical or surgical trips we are volunteering at the Hermano Pedro Hospital here in Antigua. The hospital serves to provide care to the poor people of Guatemala locally and throughout the country. The hospital has many medical clinics, pathology, X-ray department and a 5 bed surgical suite, recovery room and some beds for overnight stays. Neva & I are volunteering in a part of the hospital that functions as an orphanage. There are approximately 45 children in the dormitory where we volunteer ranging from 2 years of age to 28 years old. The children have a variety of disabilities including cerebral palsy, hydrocephalus, downs, seizure disorders, and autism. Their extreme physical limitations make it necessary for all to be in wheelchairs except one who is autistic. Nearly all require total care. We arrive in the early am to help feed breakfast and then provide oral care. Afterwards, we take them out on this veranda that is in the picture.... hold, talk and play with the children. It is so amazing to watch them respond to a touch, a smile, a little music or their name. We can't say enough about the Guatemalan staff that care for these sweet ones around the clock....they are truly wonderful! While there is definitely a serious side to the work, by far, it is one of joy and many laughs. Melvin provided us with one of these moments a few days ago. He was not having a good start to his day. I began to feed him a rather large bowl of frijoles, bread, and egg when all of a sudden, he placed both hands in the bowel and then "threw his hands up with the food". SO Melvin did not want frijoles this morning! So, the staff gave me another bowl, this one, full of a liquid vegetable (high protein) mush to feed him. I placed a spoonful in his mouth, he spit it out with force and accuracy that I can only remember my Grandfather possessing. Dispite this behavior Melvin is a very sweet, joyful child. In the Gospel of Matthew 18:10 it states"Be careful, do not think these children are not important. I tell you these children have angels in heaven. Those angels are always with my Father in heaven. On Wednesday, we traveled to Chichi to join the medical mobile group who were from Texas, Alabama, Arkansas, and other surrounding states. We were the only RNs on the trip, so we helped the staff with vital signs, lab testing, answering questions and translating as the need presented. A new adventure for me (Glenn),the second week in ChiChi, was the construction of bathrooms for a newly built church. There was a great group of men who flew to Guatemal for this project to work with members of the church in Mactzul III. I really enjoyed getting to know these men and working beside them in the mud and cement. I learned a lot and now can mix cement and build a wall with concrete blocks ( hope my wall stays upright). We sent the cement mixer (fondly named Fernando by some of the group) to another church that is being built at Mactzul V. It is great to see the church growing in these small villages to the extent that they are ready for their own buildings in which to worship. It was good to be back in the highlands of Guatemala working alongside the HTI team in that area. Our next trip is the first of August when we travel to the coast (Montellano) for a week of plastics/general/ENT surgery. It has been awhile since we posted an update. In April we moved to Antigua and are now volunteering part time with HTI for the surgical team trips. This is where we started many years ago and work we continue to find meaningful and satisfying. We are blessed to be able continue with this mission work. This will allow us to spend more time at home helping Neva's parents and visiting our children, too. This past week we were with the surgical team at Montellano. One of the Elder's from Fairview Road Church of Christ (and a dear friend), Jerry Templer, came on his first trip to Guatemala. It was an encouragement for us to be with him. As an ENT surgeon, hopefully, he will return to do surgery with HTI in the future. The team was comprised of veterans and individuals new to the HTI ministry. The teamwork was amazing, as usual, and we cared for approximately 73 patients during the week. As we experience on each trip, it was sad to tell everyone goodbye, but we anticipate seeing many of our old and new friends in the future.